After nine episodes wondering why The Thinker embarked on this insanely complicated plan to bring Barry out of the Speed Force, we finally get a glimpse at the next huge stage of his plan — and it’s going to blow you away. Spoilers follow for The Flash mid-season finale. Early on this episode, we see that DeVoe’s condition is getting worse, but they’ve got a plan. He mentions that it’ll still be his words even if he has a “new voice,” which is more than enough to make us worried. It quickly becomes apparent that because of his body’s accelerating deterioration, Clifford DeVoe needs to steal someone’s body, and the most practical option is none other than Barry Allen. Considering the insane devices he and his wife have been able to create so far, it doesn’t seem that outlandish that they could work out some kind of brain transference. Body swaps in genre media are as old as sci-fi itself, but The Flash’s take on the premise feels a bit more dire. What could possibly be better than having both the fastest mind and the fastest body, right? Wrong. Barry and Iris have a very short-lived grace period after their honeymoon. DeVoe’s fancy chair has plenty of tricks we haven’t seen before. 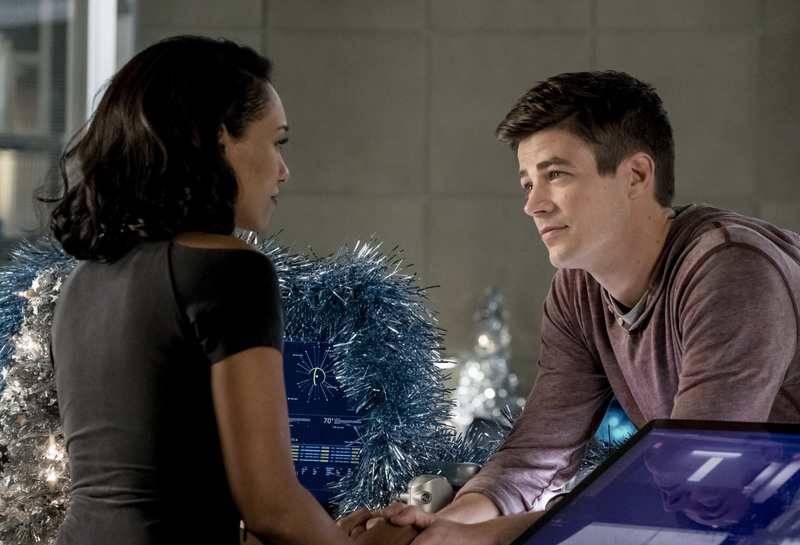 While Barry and Iris are on a festive date in the city, The Thinker blindsides them. When Barry runs at him, The Thinker whips out a few Doctor Octopus-looking tentacles to grab him and shock him into unconsciousness. But at Jitters across town at virtually the same time, Amunet makes a triumphant return and snatches Caitlin. Amunet needs Caitlin this time around — not Killer Frost — so she can perform surgery on a new telepathic meta that she not-so-accidentally shot in the head. The team, mostly just Iris, then has to make a choice: Do they use their resources to find Caitlin or Barry? Unfortunately for the Scarlet Speedster, his new wife decides to leave him hanging under the assumption that Caitlin is more vulnerable. The Thinker takes Barry to the lair we’ve come to find so familiar, keeping him in some kind of barrier that, of course, prevents him from penetrating or phasing through it. We spend almost the entire episode afraid that The Thinker’s somehow going to steal Barry’s body, but in the final moments of the episode, the true plan emerges. The Thinker and The Mechanic were actually working with Amunet all along, trying to buy the telepathic bus meta (which Cisco names Brainstorm, by the way). Why? Because after Barry inevitably escapes, The Thinker trades his mind with Brainstorm’s, scoring an invite to Christmas dinner in the process. The villains then stab DeVoe’s original body to death with a knife, leaving the body in Barry’s apartment just as the police arrive. When Season 4 returns, we’ll get Barry in prison and on trial for murder, with the only clear option available being to publicly reveal his true identity as The Flash. Will The Flash change forever in this way or somehow manage to avoid the seeming necessity? We’ll find out in more than a month when this season picks up again. The Flash returns to The CW on January 16 at 8 p.m. Eastern.